This summer, 51 Atlanta area teens traded their shorts for scrubs and in the process changed the lives of those in need at Emory Saint Joseph’s Hospital. 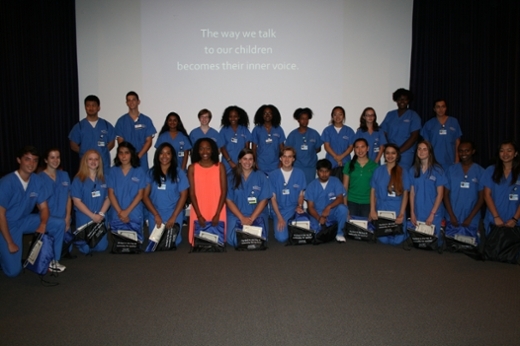 The hospital recently honored these stellar students during a graduation ceremony for their participation in the eight-week VolunTeen program. The VolunTeen program was established more than 35 years ago by the Saint Joseph’s Hospital Auxiliary volunteers as a way for students to gain valuable work experience while also learning the ins and outs of health care. For many teens, it is their first work experience, and the goal of this program is to provide an opportunity for students to interact with a variety of people, from nurses and physicians to patients. After submitting an application for the program, completing a job interview and receiving training at an orientation session, the young men and women are required to complete 36 hours of service. However, many exceeded that commitment, including Tu Khong, who completed 112 hours of service. "This experience was a great way for me to challenge myself," says Khong, the valedictorian of Clarkston High School. Khong’s experience included transporting patients, cleaning up and making beds in patient rooms, and observing surgeries. "My goal is to become an orthopedic surgeon, and the VolunTeen program was a great way for me to learn every phase of how a hospital works." During this year’s program, the VolunTeens completed more than 2700 hours of volunteer service in all areas of the hospital. Some of their duties included transporting patients, assisting with the delivery of supplies around the hospital, updating information on white boards in patient rooms and helping nurses on the units. In fact, several teens cheerfully greeted and escorted patients and their families arriving for surgeries at 5 a.m.
"Our VolunTeens lightened the burden of our staff and physicians every day," says Allison Hager, Director of Guest and Volunteer Services. "They also continued the mission of the Sisters of Mercy (the founders of Saint Joseph’s Hospital), which is to provide compassionate care to our patients. We are so proud to have inspired the next generation of caregivers."